Nathaniel Elijah Martinez, 13, of Junction City, KS, passed away Wednesday March 13, 2019. A rosary and private family gathering was held Saturday March 16, 2019 at 3pm. No other services are scheduled. Elijah was born on May 4, 2005, in Lawton, Oklahoma. At an early age he moved to Junction City, Kansas. He attended Washington Elementary and then Junction City Middle School. He enjoyed vocal music where he was previously a member of PAC and cross country. 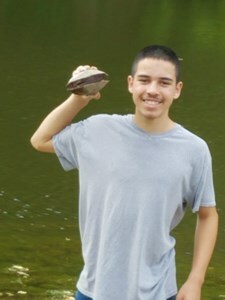 Elijah loved the outdoors, video games, and his family and friends. Elijah is survived by his loving family: his parents Martha Aponte and David Hittle; his biological father Samuel Martinez Jr.; his siblings Damian Hittle, Esperanza Aponte, and Rebeka Hittle; three grandfathers Samuel Martinez Sr., Leslie Hittle, and Miguel Aponte Sr.; four grandmothers Madelyn Martinez, Catherine Hittle, Maria Aponte, and Caridad Jaramillo; and a host of loving family and friends. ** To leave a special message for the family, click the "Share Memories" button. Add your memories to the guest book of Nathaniel Martinez. There is too many things that run over my mind to says but theres isn’t for a sadly loss. I never had the privilege of meet my cousin but he came from a great family and I have no doubt he was a great boy. Martha, I send you a big hug and all the good vibes. I love you. I cannot be sorrier. There are no words to make this time easier. Please know that you are in my prayers. Gabriel Luna was his cross country friend. Very respectful young boy. We are both saddened by his passing. Words don’t come close to expressing how heartbroken we are at your loss. We are so so very sorry to hear about Nathaniel’s passing. He will forever be the quiet little boy playing in his diapers with our kiddos. Our prayer is that God bring your whole family comfort through your grief as well as courage and strength for the days ahead. We love you and we pray for you. I am so very saddened to hear of this news. My thoughts and prayers are with you all. I pray for your strength and healing in this toughest of times. Hug all your persons. Martha and family. I am so, so sorry! Elijah was such a fun loving kid and we missed him in scouts. I loved his big smile. There are no words. My heart hurts for you all. Martha and David, call or message us if you need anything. Cuando sobrevives a la perdida de un ser querido...todos rapidamente te dicen lo fuerte que eres y que duro debio ser...pero en realidad nadie tiene la opcion de sobrevivir la perdida..No es opcional.. solo tienes que llorar en la lucha y orar a Dios que saldras adelante en tu dolor..
Nataniel siempre estaras en nuestros corazones.. I love how he was so funny and sweet to everyone he had respect for everyone to. I love when we'd go to the park and go swimming. I love him so much and as sad as I am I'm happy he's in a better place. I love him and I will never forget him. Nuestros mas sincero pesame a toda la familia, le recordaremos siempre su sonrisa y su humildad,seguimos pidiendole a Dios por fuerza y fortaleza para todos . Pastor Carlos Matos y familia. Nathaniel was so kind and funny, I remember when we would play we would mostly be laughing. He was always so sweet. He will be greatly missed. My loving grandson. I loved you since the day you was born and I thank God for the time that we had together and the fun that we shared. I loved your big heart, your infectious smile and your big appetite. You were such a handsome boy. You might not be with us anymore, but you will always live in my mind and in my heart. May you rest in peace. My heart goes out to each and every one of you. Please know I am here for you, if you need anything or just an ear to listen. I remember growing up, Nathaniel would come visit his grandparents (my uncle & aunt) and we would always play or have some fun trip going on. He was always so quiet and sweet, but when he finally got comfortable he always made us laugh with his goofy ways. He will be dearly missed. Rest in God’s presence and peace, beautiful soul.